A 77 MPH Little League fastball might not be equivalent to a 100 MPH major-league fastball, but a pitch to the crotch is painful at any level of baseball. 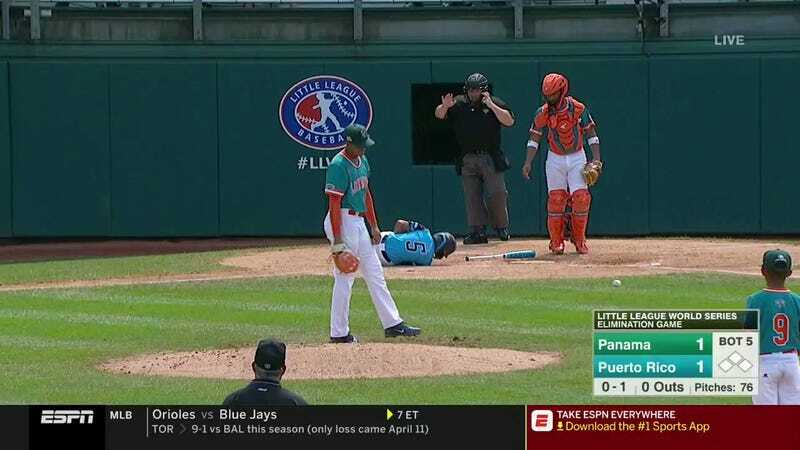 During today’s Little League World Series elimination game, Panama lefty Arod McKenzie let a pitch get away from him, and Puerto Rico second baseman Angel Vazquez suffered the consequences. Even if it hits the cup, it still hurts. Poor kid. Vazquez was taken out of the game, but according to the play-by-play, his replacement scored one of the two runs in that half of the inning as Puerto Rico won, 3-1. That’s still not a worthwhile tradeoff for him, though.